Join the most exciting multiplayer Golf ever! Challenge players all over the world! Not just golf. This is action-packed Mini Golf with full of adventures and thrills you've never experienced before! Firing your shot is easier than ever. Just drag and release to hit the ball like playing pool! 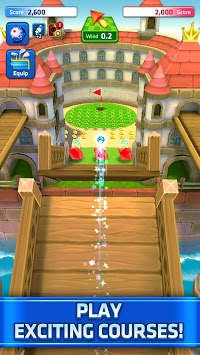 Aim and shoot carefully to collect the most gems while taking the fastest route to the hole. You can even clash your ball against your rival's to take out their gems! Arcade Mini Golf has never been this quick and fun! Putt your way through wonders. Golfers' wildest dreams finally come true! Let's ride tube slides, swing on drawbridges, jump over pyramids, explore mazes with bomb traps, and reach farther and fly higher with accelerators and jump pads! Taking advantage of all the tricks while honing your skills is the key to victory! 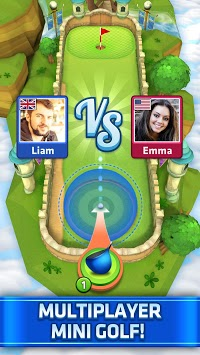 - Exciting Mini Golf duel in real-time online multiplayer. - Simple and intuitive control: Swipe and release to strike! - Compete against players from all around the world to take their coins and trophies! - Play on 35+ beautiful golf courses with tons of dynamic tricks and fun. - Unlock chests to discover powerful new golf equipment and upgrade existing ones: drivers, irons, sand wedges, putters, balls and gloves! - Progress through more advanced stages all the way to the top. - Get promoted in the weekly leagues to win chests and card bonus. - Conquer three tournament rounds, take mega prizes and be the golf champion! - Sink every putt and get special rewards in Hole-in-One Challenge! - Travel through 50+ holes and earn stars for special rewards in Tour Challenge! - Connect with Facebook to send and request free gifts! - Play online matches with your family and friends! - Contacts: Used to verify your Google account in the login process. - Phone: Used to check your connection status to the game. - Android OS 6.0 or later: On your device, open the main ""Settings"" app. Tap ""Apps""(or ""Application Manager""). 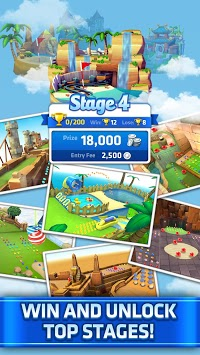 Tap ""Mini Golf King"". Tap ""Permissions"". Move switches to the right or the left to turn the permissions on or off. - Android OS earlier than 6.0: You need to upgrade the OS to control each permission. Otherwise you may uninstall ""Mini Golf King"" app to revoke them as a whole. * The app icon and in-game graphics have been updated to put you in a holiday mood! * You can find exclusive Holiday Tees in certain chests starting in December. * Holiday Offers are also available.